If an iPhone goes missing, well, there's an app for that. (It's Apple's venerable Find My iPhone.) But where's the equivalent for Android? Surely there must be some app-tastic way to locate a rogue Android handset. The app goes above and beyond the usual method of locating a missing phone: calling it. If your phone is set to vibrate, you're much less likely to hear it. And, of course, if it's not within earshot (i.e., you dropped it at that rest stop on the interstate), calling does no good. With Where's My Droid, you text a secret "attention" word or phrase to the phone. That activates the app's find-me mode, which switches the phone from vibrate to ringer, cranks the volume, and makes it ring for 30 seconds. What's not so nice is that you need access to another phone so you can send your attention-word text messages (and, if necessary, get the GPS reply). Also, if you want remote-wipe capabilities, you'll need Where's My Droid Pro ($3.99). 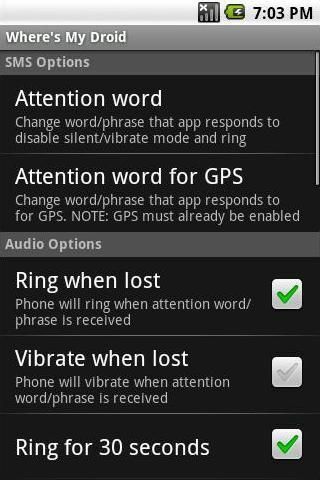 That version also lets you use a custom ringtone and "found" button. Still, it's hard to argue with a free app that's a potential lifesaver (well, phone-saver, anyway). If you've found a lost-Android app you like better, tell me about it in the comments!